SCENES FROM A HORROR MOVIE??? It is a truth that has been going on for way too long, slipping through the cracks, hidden among the shadows like some sort of predator in the night.... and even though such horror is only seen in our worst nightmares or scenes from the most terrifying horror movies -- what is happening is not imaginary or scripted - this is a reality and it is happening in many factory farming industries around the world. Going unseen these innocent lives suffer, and countless individuals don't know that these occurrences are even happening, or they simply choose to ignore in hopes that if they don't know about it, it will go away or simply not exist --- a silence that has permitted these scenes to under the radar for many many years. But MERCY FOR ANIMALS is not about to let these truths go unexposed - and they are working dedicated and determined to drop the curtain on these places, and show the world exactly what has been going on. 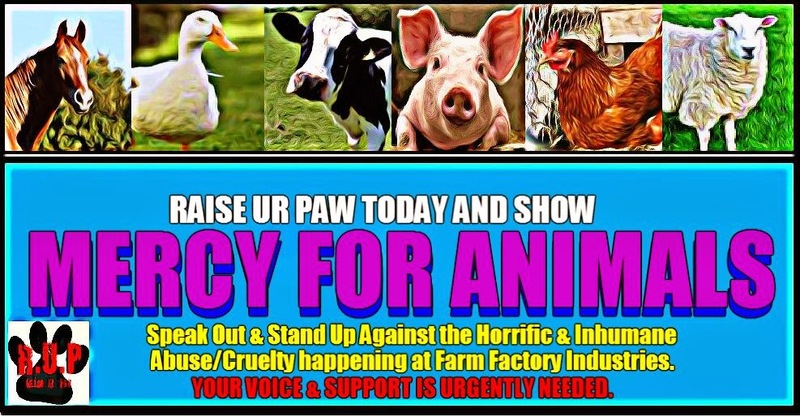 The information that they display on their facebook page is not only eye opening, but very informative and educational - and that is why I took a moment to click on the link to a blog entry called "7 FACTORY FARMING PRACTICES STRAIGHT OUT OF A HORROR MOVIE!" - and although it was heartbreaking to read, it was information that needed to be said and brought into the light. With this horrific reality happening, I am quite surprised and saddened that more people are not getting involved to help these innocent babies, Governments included - to bring forth change & protection, more so then what is already set for our beloved voiceless - especially when the truth is right there for the whole world to see. GRINDING MACHINES - Male chicks, due to they can't lay eggs, are taken by conveyor belts towards a grinding machine, where they will be disposed off in the most inhumane manner - tossed away like mere garbage. ABUSE/CRUELTY - inhumane actions taken against the animals which cause suffering, pain, injuries and sometimes even death. MUTILATIONS - actions taken such as tail docking, dehorning, castrations etc without any pain medication given to these poor babies. These actions are just a few of what happens behind the scenes at some factory farming industries, and that is why it is so important that we get our paws and voices raised, so that these industries will not only be exposed, but also brought to justice for these inhumane crimes against nature. It's time that the welfare/well-being of these innocent lives come first, and that the Governments are pressured to do what is necessary to protect and save these innocent souls. Please Be A Voice and let's show MERCY FOR ANIMALS - you can make a difference, but you have to choose to do what is right.